The view from my kitchen window is presently very dramatic. 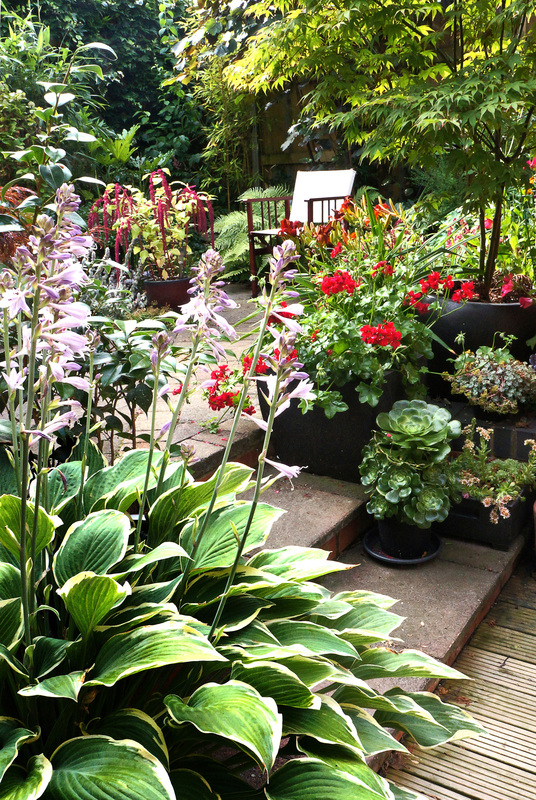 Thanks to the flowering hosta, scarlet pelargonium and vibrant daylilies creating a sea of red. But best of all is a pot of love-lies-bleeding (amaranthus caudatas) as a focal point. By accident an amazing combination, if unorthodox, presented itself as the deep-magenta tassels drip into the grey jaws of the stachys byzantina. Stunning. Incredible yields and beautifully formed round courgettes. Monster yields of courgettes (eight ball F1) have led to me giving away dozens and I have had lots compliments on how sweet they are. They have been roasted, frittered, souped, stuffed and made into cakes. More exciting is my first cauliflower is ready, and much more developed than the other three that were planted at the same time. Purple French beans are just starting to produce abundance too. 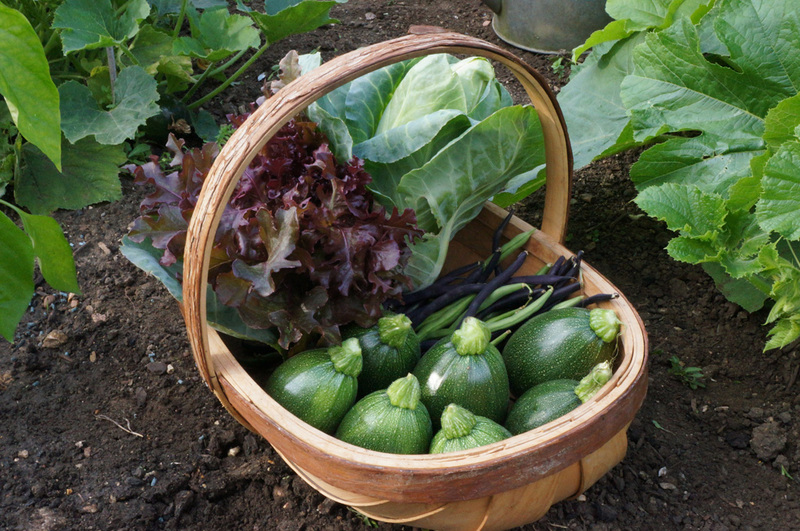 Also in the monster department, I’ve a pumpkin that I planted at the end of the French beans to make use of the bean trench that I prepared in winter. In a raised bed, I have three rampant butternut squash plants that have excelled themselves by monopolizing a cold frame and using it to climb over. The squash have invaded the mange tout bed and I’m forever moving the pumpkin out of the potatoes. The garlic needed lifting as there were signs of rust and the red onions need storing. I had to be careful with the onions, as some very furry ground-nesting bees have set up home amongst them. I had previously removed the netting because as the bees got bigger they struggled to climb though the net-holes. A few sacrificial onions near the bee entrance have been left, as I’m not sure how large the nest is underground. It is still a pleasure to watch them buzz over to the marigolds, then see their legs loaded with bright orange pollen as they lower themselves into the ground. Garlic protects the sleeping onions from vampire attack. 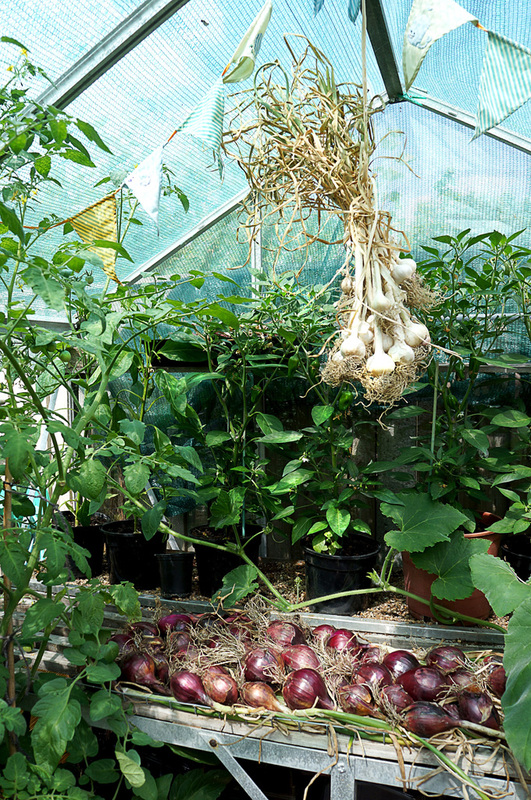 In the green house I have all the ingredients for a killer sauce coming too. Tomatoes, chilies, garlic, sweet romano peppers, and onions laid out for ready for racking in the shadier area here as I fear there’s mice in the garage. But my next job is winter broccoli, ideally they would go where the bees are, but I’m going to have to find somewhere else. If only they knew .